The English talk about the weather because we find the exchange of personal information too uncomfortable. I wonder whether it would be possible to overcome those inhibitions at TEDxExeter? We could prepare ourselves, have a question ready to ask and be open to the questions others ask in return. 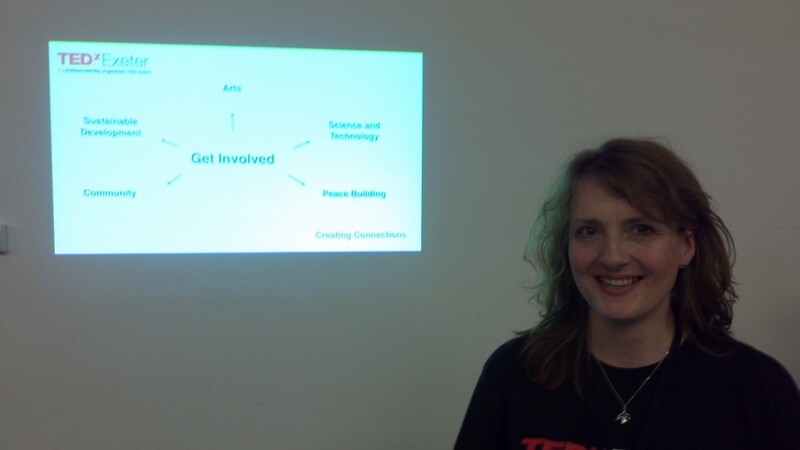 @damocross @clarebryden @borispomroy Since you ask, I shall be at #TEDxExeter tomorrow. I’m a stranger. What will you ask me? Click the date to discover what happened next in the virtual world of the Twittersphere. To cut a long story short, I decided to ask some English strangers the question “Are you worried about the Arctic Sea Ice“, in part because it is in fact related to the English weather, but mainly because it’s a subject I think everybody should be interested in at the very least, although very few people actually seem to be! In real life the next day Kasia and I arrived at the Northcott Theatre, and I set about asking people my question, along with trying to find the strangers I’d “met” on Twitter the evening before in order to ask them my question face to face. The people we sat down next to were certainly worried about Arctic sea ice. After that I also managed to put my question to a couple of the speakers from the first session. Both Peter Owen-Jones and Jonathon Porritt were very worried about the Arctic Sea Ice. After the next session of presentations we were queuing for lunch when Damo unknowingly came up to me to ask me if I’d like to put my business card in his bucket. I discovered that his company Colour Burn was filming the event, and that he too is very worried about the Arctic sea ice. Why do most economists, and politicians, think that the economy can grow for ever, and ever, and ever? This is a strange rather perverse story. Let me put it this way in very simple terms. It’s a story about us people, being persuaded to spend money we don’t have, on things we don’t need to create impressions that won’t last on people we don’t care about. By the time Stewart Wallis left the stage at the Northcott I had discovered that Clare was in fact the TEDxExeter Storyteller, and that she was sat with her laptop at the back of the Northcott Theatre. I caught up with her there after the show was over, to discover that whilst she was aware of the declining sea ice in the Arctic, she didn’t seem at first sight to be as worried about it as Damo or Stewart or I. 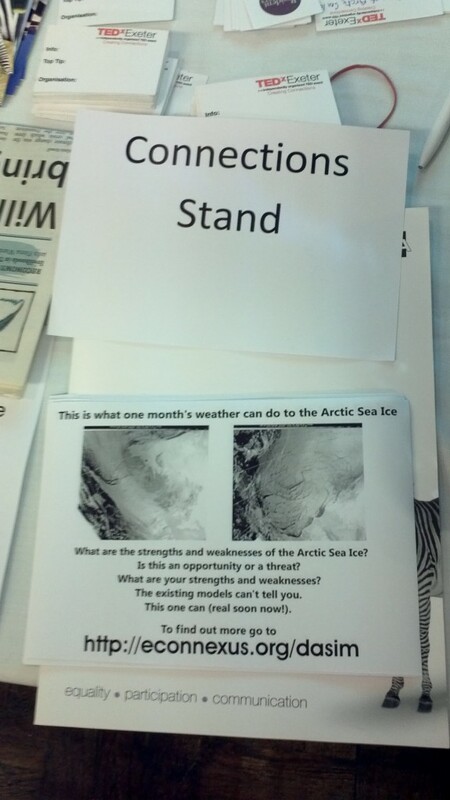 Are you worried about the Arctic Sea Ice? This entry was posted in Jim and tagged Arctic, Jonathon Porritt, NEF, Northcott, Peter Owen-Jones, Stewart Wallis, TED, TEDxExeter, Twitter by Jim. Bookmark the permalink. Well, that didn’t work out in quite the way I imagined it might. Clare has informed me that I have inadvertently “pressed at least two of [her] buttons”. She has accepted my profuse apology on her own blog, whilst also informing me that “I now consider the matter closed”. This all seems to suggest, to me at least, that communications in cyberspace, particularly when limited to Twitter’s 150 characters or so, are fraught with difficulty. Whilst considering the matter closed Clare has nonetheless raised some “serious issues” about “sea ice, campaigning good practice, and privacy”. For the record, I’ve described in the post above events from tea time on April 11th until tea time on April 12th as they happened, from my own perspective. I’ll therefore now pose the same question here that I asked over there. Thanks for these excellent pieces which I was very glad to find, as they touch on my current issues. I was, however, looking for the most appropriate place to bring this to your attention, which you, being European, probably already know more about than I do. so, not appropriate, but here it is anyway. Perhaps it does touch on the Arctic, as all things northern hemisphere do, in its indirect way. My pleasure Susan! Another storm now following in the footsteps of the “Saint Jude’s Day Storm”?